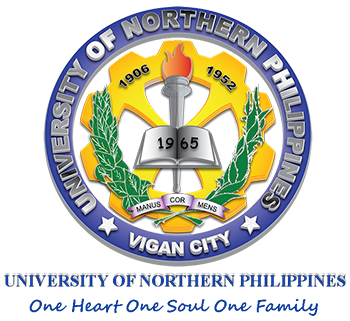 The University of Northern Philippines (UNP) holds the distinction of being the first state university in Northern Luzon. It was created through the enactment of Republic Act 4449 authored by the late Congressman FLORO S. CRISOLOGO and approved on June 19, 1965. The said Act converted the Ilocos Sur School of Arts and Trades in the Municipality of Vigan, Province of Ilocos Sur, into a University. The governance of the University is vested in the Board of Regents. The first board was constituted on October 14, 1965. 1906 – Establishment of Vigan High School (now the Ilocos Sur National High School). 1910 – The shop department of Vigan High School was converted into a separate intermediate level school which became the Vigan Trade School. 1931 – Vigan Trade School became the Ilocos Sur Trade School. 1951 – Ilocos Sur Trade School was converted into the Northern Luzon School of Arts and Trades through Republic Act 647. 1989 – Candon Community College was integrated into the University of Northern Philippines through Republic Act 6744 sponsored by Congressman Eric D. Singson. 2010 – University of Northern Philippines-Candon Campus was separated and converted into the North Luzon Philippine State College through Republic Act 10085 sponsored by Congressman Eric D. Singson.